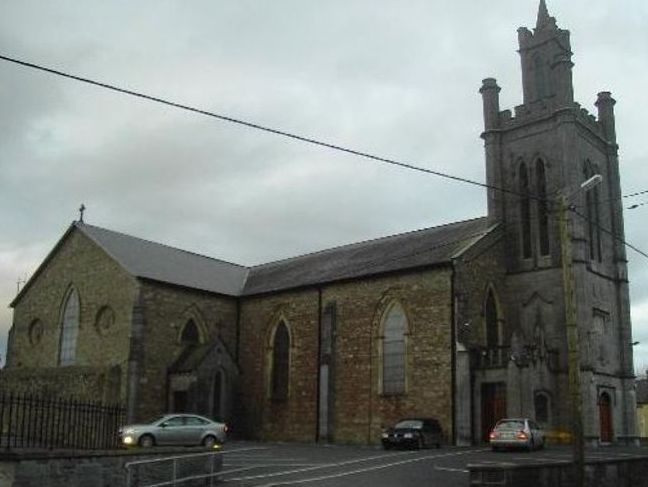 St Mary's is the Parish Catholic Church in Cahir, Co Tipperary, the northernmost parish in the diocese of Waterford and Lismore. Welcome to our website - by clicking on the various links you will be able to see relevant information in more detail. Please do so to get a feel of what Cahir as your parish has to offer you. We bid a céad míle fáilte to Very Rev Fr Tom Rogers who has joined us as Parish Priest from Waterford. 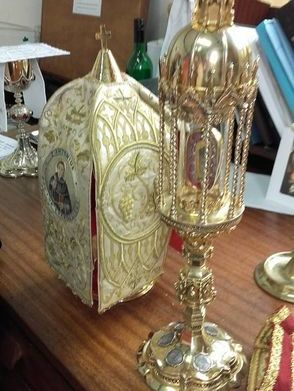 The Parish of St Mary's was lucky enough to be selected as one of only five in Ireland to have the relics of Saint Anthony of Padua displayed. The event took place on Thursday June 9 2016 before a sizeable gathering through the day. From the 9th to the 16th of June 2016, St Anthony's relics visited Ireland in the form of two relics, one of which is the one Pope Francis venerated sixteen years ago in Argentina. The relics were accompanied by Fr Mario Conte, editor of the Messenger of St Anthony, the magazine published by the Conventual Franciscan Friars of Saint Anthony's Basilica in Padua, Italy, where the Saint lies in his Tomb. When Pope Francis was Archbishop Jorge Bergoglio of Buenos Aires, he led a prominent procession through the streets of the Argentinian capital in the year 2000, carrying in his hands a reliquary containing a precious relic of St Anthony of Padua - a piece of his floating rib.The future Pope's devotion to St Anthony was due to the Saint's love, care and concern for the poor and marginalized. Known for helping people find lost items, St Anthony intercedes with those trying to find a job, a home, faith, love, hope and mercy. The Parish of St Marys would like to wish the best of good health to Bill Noonan who retired from his duties as Sacristan at the end of December 2016. Bill fulfilled the role to the community for close on thirty years and always went about his tasks with the minimum of fuss but with a real dedication. His total commitment to the job ensured the smooth running of the parish liturgies over the years. Always approachable, the priests and people of Cahir and surrounds appreciate your sterling service. Thanks Bill ! Congratulations to parishoner Denis O'Mahony who has been awarded a Benemerenti Medal by Pope Francis for his outstanding service to the community. Denis continues to be a tireless volunteer with organizations such as St Vincent de Paul, Meals on Wheels, the Day Care Centre, the GAA and the Credit Union amongst many others having had the benefit of his experience, knowledge and dedication over the years. At 11.30 Mass on Sunday 22 November 2015, Denis was presented with his scroll and medal before an appreciative congregation. The John Paul II Award is an award offered to secondary school students who complete 20 hours of community work and 20 hours of parish work throughout the year. The award was one of the last initiatives introduced by Bishop William Lee before his retirement and encourages young people to get involved in their community and parish. The four schools and parishes involved in the pilot scheme were C.B.S Tramore, Stella Maris, Tramore, Coláiste Dún Iascaigh, Cahir and Blackwater School in Lismore & Cappoquin parishes. The John Paul II Awards were introduced in Derry in 2006, as an initiative to promote young people's involvement in their Parish and Community. 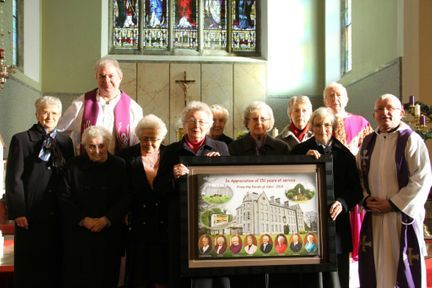 The Diocese of Waterford and Lismore, introduced the Award as a Pilot Scheme in 2013-2014. Colaiste Dun Iascaigh, Cahir was one of the schools who participated with great enthusiasm. The John Paul II Awards quickly became known as JP2 among the students, local parish and community. Guided by Ms. Josephine Wade, the School Chaplain at Colaiste Dún Iascaigh, the JP2 students began their tasks last September. At a ceremony in the pastoral centre in Waterford, Bishop Alphonsus Cullinan, presented 30 Coláiste Dún Iascaigh students with medals for having worked within the community over the last 12 months. Students read at Mass, they developed a reflective place in the Coláiste, they worked voluntarily at the Senior Citizen’s Party, they volunteered for St. Vincent De Paul, worked with the Tidy Towns committee and raised money for the National Council for the Blind and for the Tipperary Hospice, to name a few. As the students reflected on their experience, they all agreed that not only did they give a lot, they also gained a lot of confidence and strength for their endeavours. Fr Gerry Langford, then PP on behalf of all parishoners and local attendees at the school over the many decades. Our Parish Office is adjacent to the Day Care Centre. You can now contact us by email (address below) or at 052 7443447. The office itself is open Monday-Thursday 10.30am to 4pm and on Friday 10.30am - 1pm. Many thanks to those who are availing of the bank transfer method to AIB Cahir, Account No. 02809165, Sort Code 93-50-42. Many thanks also to others who wish to give on a weekly or monthly basis through box envelopes. Anyone who has been in the vicinity of the Church will have noticed the repairs completed on the church roof. The work on the leaking roof has turned out to be greater than anticipated and has required more funding. Now the antiquated heating system needs attention. To this end the weekly envelope collection began in June 2014 and your continued help is most appreciated. Parish Council and are a breath of fresh air with their views, commitment, hard work and energy. The fruits of their labours have become more apparent and will be clear to be seen as the weeks continue. We are the Church and we can all play our part.